From the creators of the award winning Habby Habanero Hot Sauce comes this steamin' hot sauce created with Habanero Peppers,carrots and mustard seed, just to name a few ingredients. 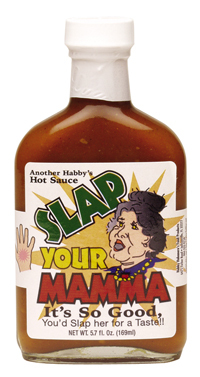 Like the bottle says, "It's so good you'd slap momma for a taste!" At first I thought there was no heat, then it slowly started kicking in. Excellent flavor, almost a BBQ sauce. The heat is delayed yet brings on a craving for more. Hot, but not too hot to really dig in. Very delicious sauce indeed - loaded with flavor! This was the best sauce I've bought so far. Tasty with both halibut and bass, but also with a ribeye steak. Vinegar, Habanero Peppers, Mustard, Carrots, Garlic, and Spices. Slap Heard Around the World! !